You are here: Home / Sports / Skip to my Schu! HR wins it for St. Lou! Skip to my Schu! 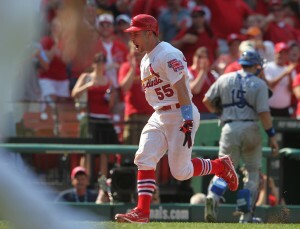 HR wins it for St. Lou! Cardinals second basemen Skip Schumaker hit his second career walkoff homer and second of the season as the Cardinals took two out of three from the Royals with a 5-4 final. Skip’s hit came off lefty Tim Collins with one out in the bottom of the ninth. The Royals tied the game in the top of the inning with a solo homer from Alcides Escobar. The win came with a price. Albert Pujols left the game in the sixth inning with a sprained left wrist after a collision first base. Pujols went 3-3 with his 17th homer before exiting. Royals starter Danny Duffy pitched 3.2 innings allowing two runs in the first, but he also struck out nine. Cards starter Jaime Garcia gave up three runs, two earned, in 5.1 innings. Escobar had two RBIs. Billy Butler and Alex Gordon each had an RBI.